Mischievous Night - BETA V.0.3 Released! Mischievious Night V0.3 is now Released! free to leave any criticism or feedback onto this thread, Thanks guys. - Where is the bonus mission? A: This is a BETA Release meaning not everything is fully finished. I have commented it out from the level script. You will not be able to access it until it is finished and i have released a build with the finished product. - Why doesn't the dialogue work for my version of the game? 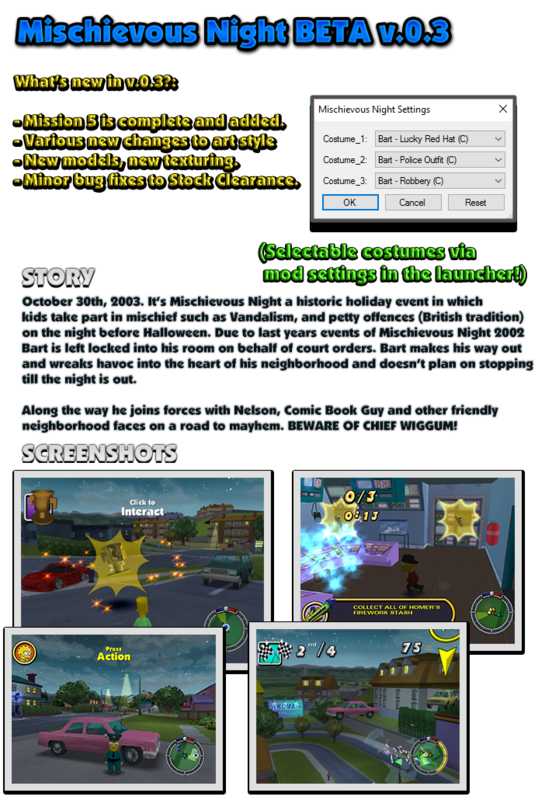 A: The mod detects and uses the English version of the game by default. i will be getting this to work on all copies though. - When will it be fully released? - New Selectable Costumes LUA feature, you can select what costumes you'd like to be available in stores. - Mission 5 is now playable! Mike Looks great man! Nice presentation as well. Looks great man! Nice presentation as well. Warrior These mods recently have been very good indeed. These mods recently have been very good indeed. willj99 Misch Night BETA is Out! Misch Night BETA is Out! Ralimu Strilem This mod Is AMAZING! Keep up the good work ! This mod Is AMAZING! Keep up the good work ! This BETA version is pretty good! I like the use of the music from Bully in the tutorial mission, and dialogue ripped straight from the show, which is pretty nice. I haven't played through most of it, but there's been a few times when a game crashed by finishing a race, the bonus mission, cancelling a mission from the pause menu or passing Nelson's mission. But then again, it's BETA, so it has to be expected, and I'm sure these bugs will be fixed in the future. I can't wait for the final version of the mod!